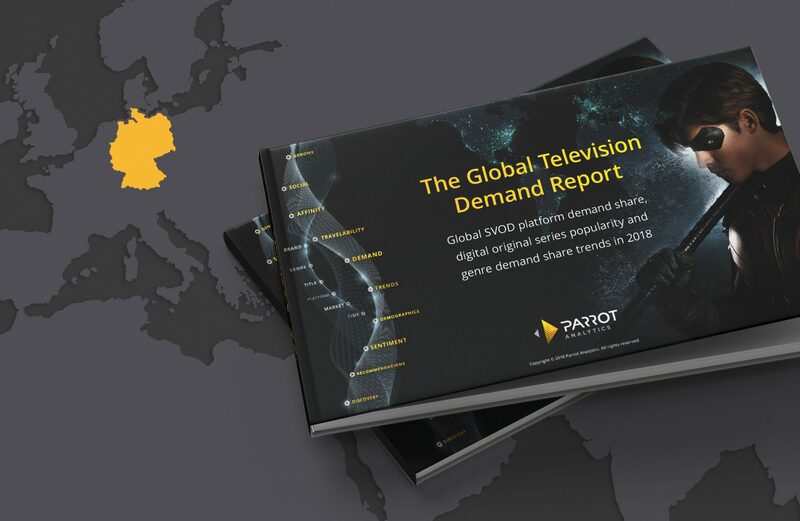 Parrot Analytics has recently taken an in-depth look at the market share of SVOD platforms in Germany based on the German audience demand of each platform’s digital original productions. 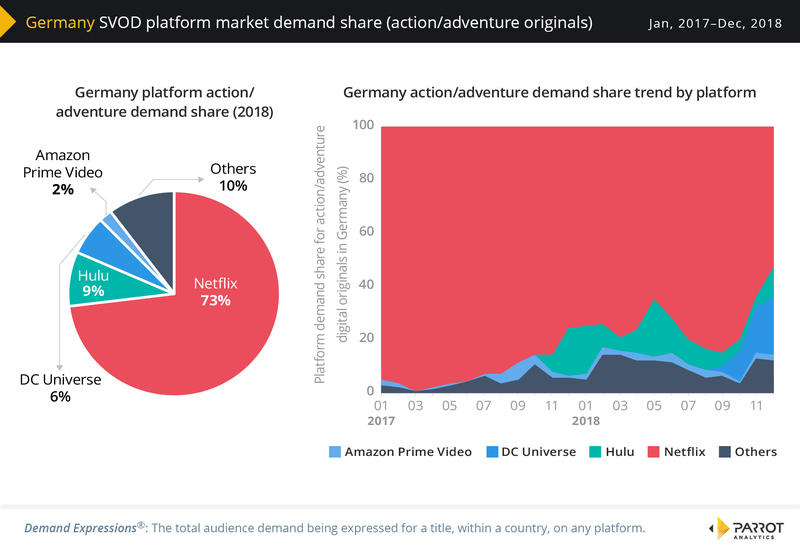 The SVOD market share report leverages Germany demand data for streaming originals from Netflix, Amazon Prime Video, Hulu, CBS All Access, as well as local SVOD platforms. Please download the full 68 page report here, which also includes data and analysis for 9 other countries: Germany SVOD Market Demand Report. Along with the UK, Germany is one of the strongest markets for Prime Video; Prime Originals have a 12% share of all digital original demand in 2018. However, Netflix continues to command the largest demand share with 69% while Hulu titles have the third largest demand share with 9%. CBS All Access is also strong in Germany: Along with two other markets in this report, CBS All Access titles have a 6% platform demand share in 2018. Hulu has made strong gains in this market in 2018 compared to the previous year. In Germany, 64% of the demand for drama digital original titles is expressed for titles from Netflix. 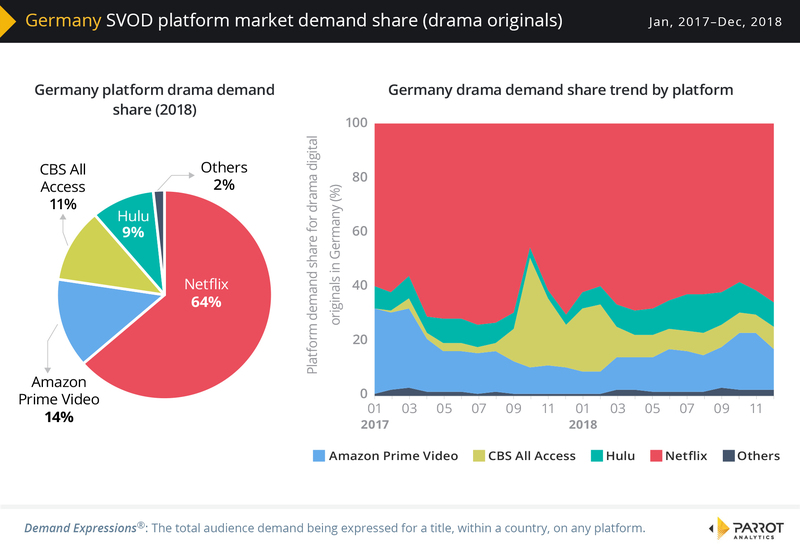 With 14% of the platform demand share, Germany is the best market for Prime Video drama titles in this report whilst CBS All Access has the third largest drama demand share with 11%. The 24 month trend chart shows that Netflix’s share of demand for its drama digital originals has been slowly eroded since mid 2017 in this territory. 73% of the demand expressed for digital original action/adventure series in Germany is for Netflix originals. Hulu titles account for 9% of the genre in this market, while DC Universe titles have a 6% demand share. As in other markets, 2018 has been a year of change for this genre; the platform demand share for action/adventure digital originals has fluctuated dramatically resulting in a decrease in Netflix’s share of demand. 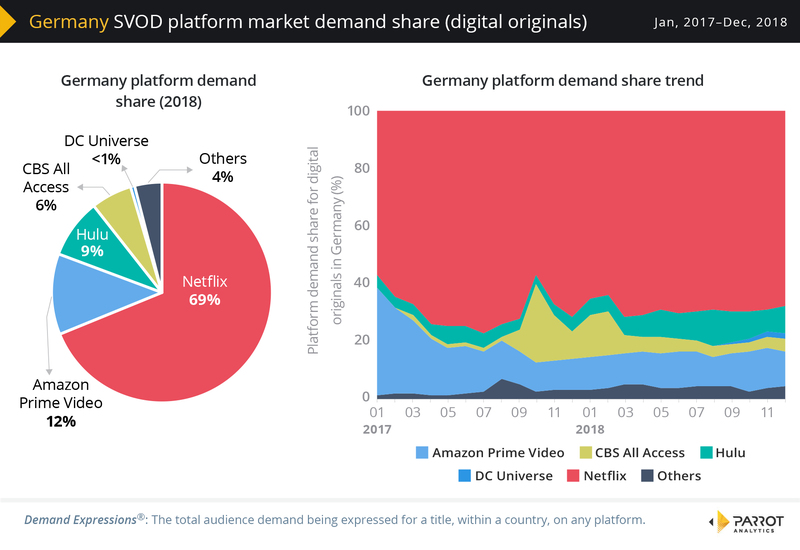 We reveal the 2018 Germany SVOD market share of the major platforms including Netflix, Amazon Prime Video, Hulu and CBS All Access based on audience demand for each platform’s digital originals. Discover how SVOD market share trends in Germany have changed over the last 24 months, including the contribution made by DC Universe. Learn where in the world content produced in Germany is the most wanted relative to the German home market; we refer to this as content travelability. Discover which sub genres resonate the most with the Germans compared to the global average. Find out what the demand distribution of a selection of digital originals in Germany looks like. Discover the top 20 digital streaming shows in Germany, as well as 5 additional titles of interest to audiences in Germany.